My brother got married this Summer and my mom and I made the bridesmaid skirts. and daisy lace fabric from Mood. It was nice because it turned out to be both mine and Heidi's favorite of all of the laces that I managed to find and it also happened to be about 1/5 the price so that worked out really well. A word of advice for anyone who's wanting to make a skirt out of venice lace though, HAVE ACCESS TO A SERGER. Oh my gosh, my serger saved me. Polyester type lace doesn't fray but heavier weight laces fray like crazy. So seriously have a serger on hand and if that's not possible, you can come use mine. ha seriously though you need a serger. Also for the scalloped hem, I used fray check and fray check spray. You can typically find lace that already has a scalloped selvage edge but this lace didn't so we just created one. It was tedious but really easy so don't fret if you can't find scalloped lace. And just for the fun of it..
:) haha sorry, I had to. I recently discovered the amazingness of Megan Nielsen sewing patterns and I am in love. They are the cutest patterns ever. And since 99% of the sewing patterns out there are outdated and old school, this is very exciting news. My only complaint is that most of them are for pregnant peeps, so that's no fun for me. I just made this shirt and I really like how it turned out. I would change a few things if I were to make it again, which most likely will end up happening since I'm in love with the peter pan collar trend right now. The length. The pattern itself is already short to begin with but then if you were to follow the directions, the shirt would be even shorter. Like, 1" shorter, which is a lot when it comes to length. I originally followed the directions and made the double-fold hem, but once I realized how short (and awkward looking) it was, I unpicked the seam and serged it instead, making a single-folded hem. This made it a bit longer but it still was shorter than I would have liked. It might just be because I'm tall though, who knows. All I know is that I would definitely make it a few inches longer next time. The interfacing in the collar. I would not use it again. The interfacing made the collar too stiff and bulky, I would have liked it to be more flowy and less rigid. Taking pictures near BYU. I would not do that again as I made a complete fool of myself in front of a bunch of guys walking to class. 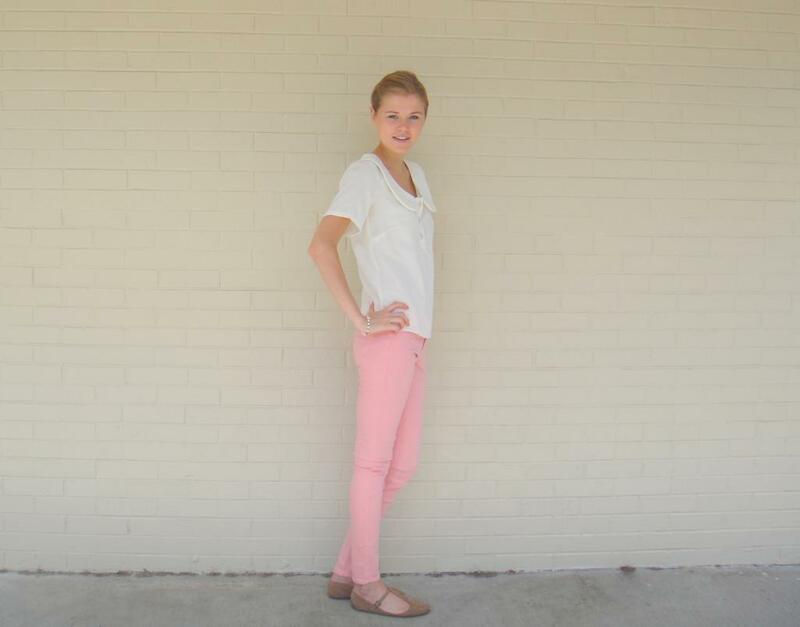 This is me pretending to act normal while my mom is taking pictures of me standing in front of some random wall. Gahh seriously how do fashion bloggers do it? I love to blog, and I love to sew, but I HATE blogging about sewing. Well no I don't actually hate the blogging part, I just hate the whole blogging process.. like taking pictures of yourself and looking extremely ridiculous/vain while doing so. I can't be the only one who feels like this.. right guys? Anyone agree that it's the most AWKWARD PROCESS EVER? I'm just hoping that with time I will get more used to it/learn not to just stand there grinning like an idiot. If you are a fashion/sewing blogger, did you ever hate taking pictures of yourself? Any tips for someone who deeply despises it?